Monday, May 21 - A full day in Venice, the city in the harbor. I must admit, that we have seen so many sites over this past week, that my head must be nearing it's capacity for remembering things. As I work on this blog entry for the day before yesterday (I can't do it on the bus or when we are out, so I have to do it late at night or early in the morning at the hotel, after I get the pictures uploaded), I am realizing that I don't remember what some of the things are. I suppose I could make notes of all the sites I would see, but that's not really practical as we are walking quickly through crowded city streets from one place to another. So, please "scusami" if I don't give good information for some of the images below. We got up early today, we wanted to get out and walk around before all the crowds showed up, and what a good thing that was to do. There were other people about, but not very many. The Piazza San Marco had almost no one in it! The view below is across the grand canal from San Marko. Another view below is one of several churches across the canal. I believe this is the same one that we went by in our gondola ride the night before. Many of the gondolas (there are 433 in the city) are "parked" here overnight. There is only one "piazza" in Venice, all the other open spaces are called courtyards, or "campos". This is the one behind our hotel. Our hotel is not the yellow building, but the salmon colored building on the right. Our room is on the top floor on the other side of the building. One of our activities this day was going to a mask makers shop and watching him show us all the steps in creating these masks that are so popular, and were such a part of the history of Venice. We had a local guide who translated what the artist was saying. She is to the left in the image below (her name is Corine). It was a very fun demonstration as he picked out six from our group and decorated them with hats and masks that told a story from their history. He was an animated story teller and Corine had a time keeping up with him! 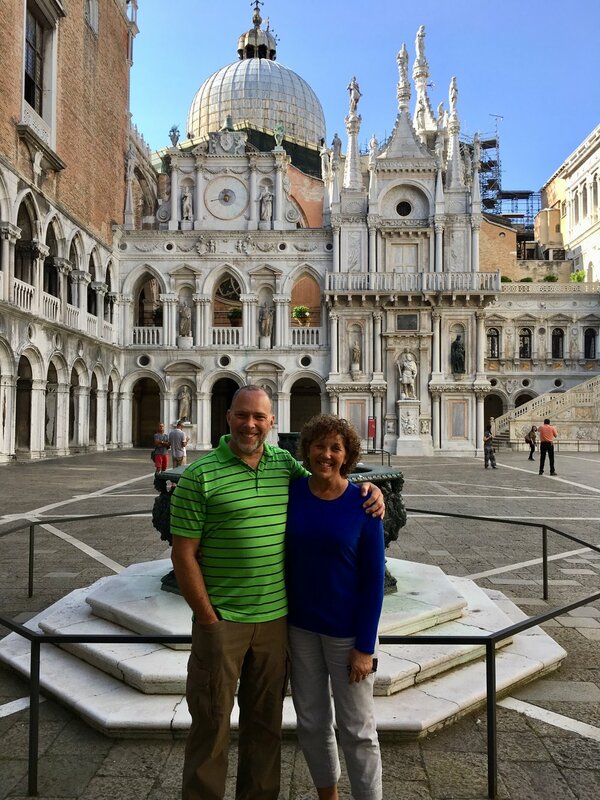 If I remember correctly, there are over 100 churches in Venice, but I know I do not remember the name of the church below. Very sorry about that. But I do know that the entire city is built on pylons 20 feet down into the mud and silt of this swamp that was before the city was here. Millions and millions of trees which were used to support the buildings, churches, and homes of Venice. It is amazing to think of the work involved to make this city in the middle of former marshland. 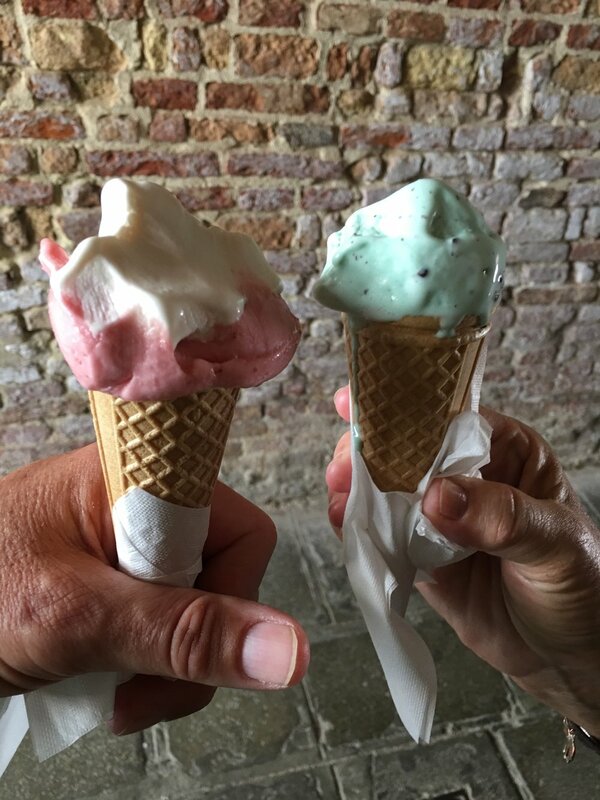 Gelato is of course the treat of choice in Italy and we have certainly enjoyed some on our trip. As is usual, we dig right in before we think to snap a photo to share with you back home! 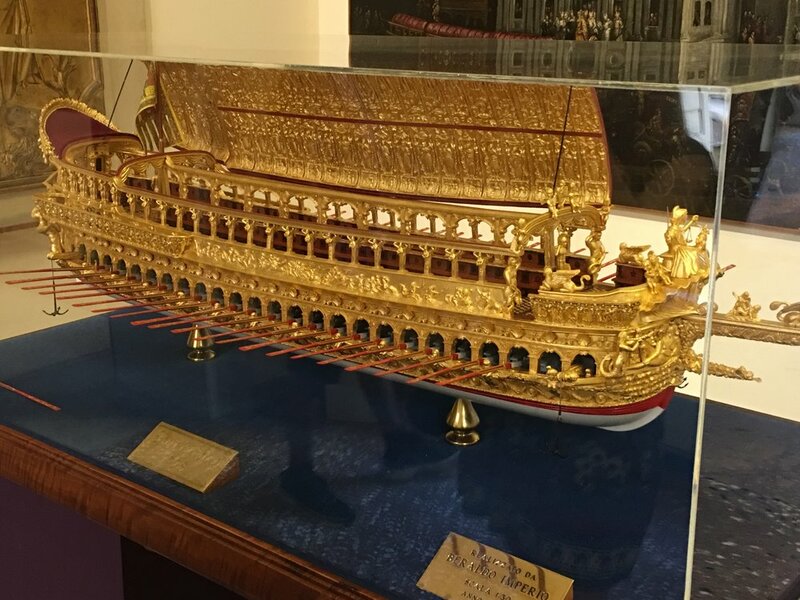 Below is a model of the Doge's ship which we saw at the Correr Museum in San Marko. The Doge was the leader elected by the ruling body of merchants from that body to rule Venice for the remainder of his life. There have been a hundred Doge's in Venice's history. The Correr Museum has many exhibits about the Doge and Venetian history. The largest meeting room in Europe is in the Doge's palace. 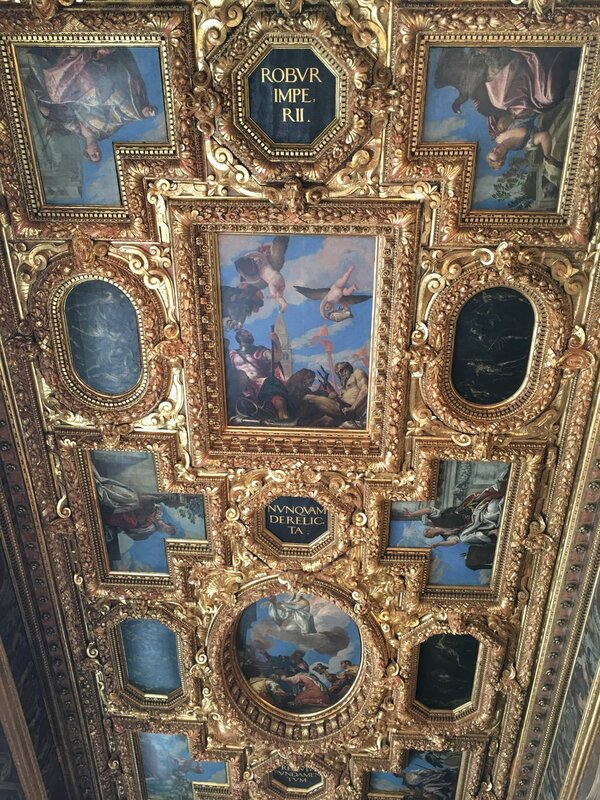 The walls and ceiling (below) are all decorated with marvelous paintings and architecture. Since I cannot read or understand Italian, I do not know the history of this hole in the wall. You can see light shining through a small slot in the wall behind this double doored hole. On the other side of the wall is a huge room with no fanfare around the small slot there. I'm sure there is an interesting story behind this hole. If anyone knows what it is, leave a comment for us and give us the scoop! 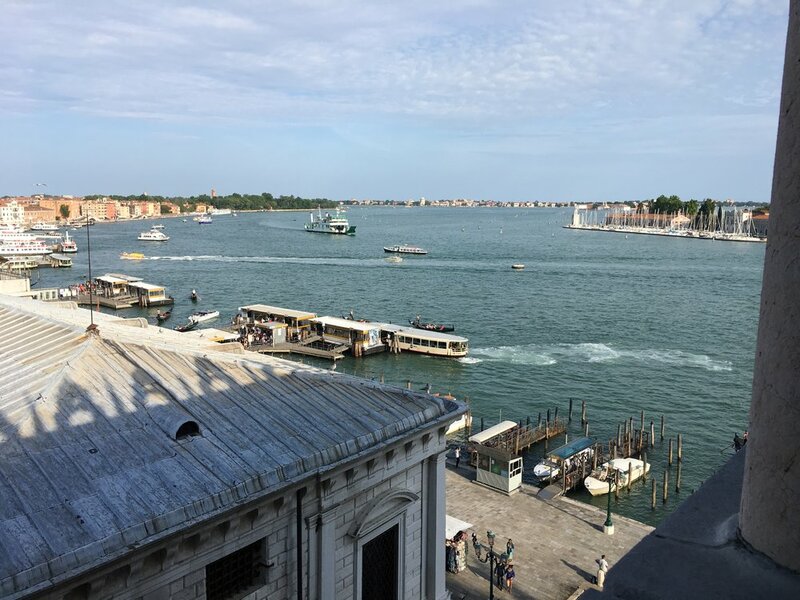 A look out of a window in the Doge's Palace at the grand canal. 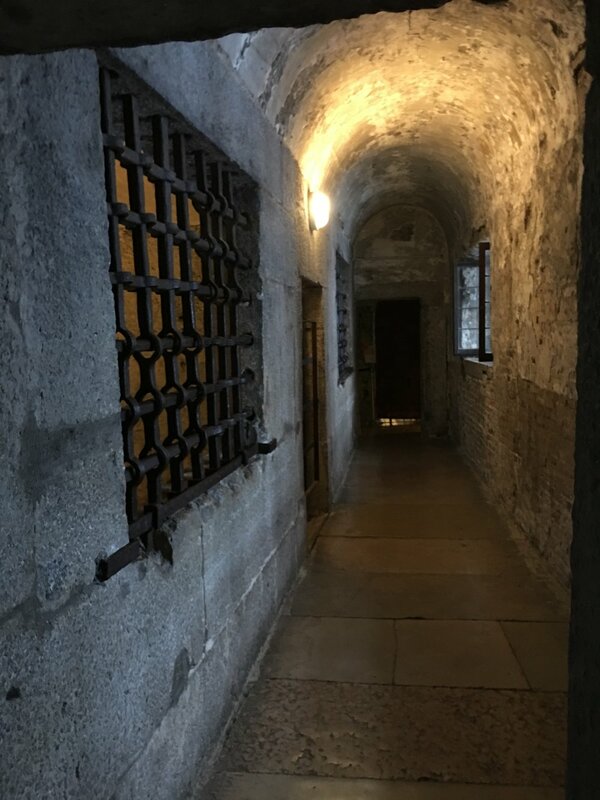 Below is an inside view of the "Bridge of Sighs" that runs between the Doge's Palace and the prison next door. 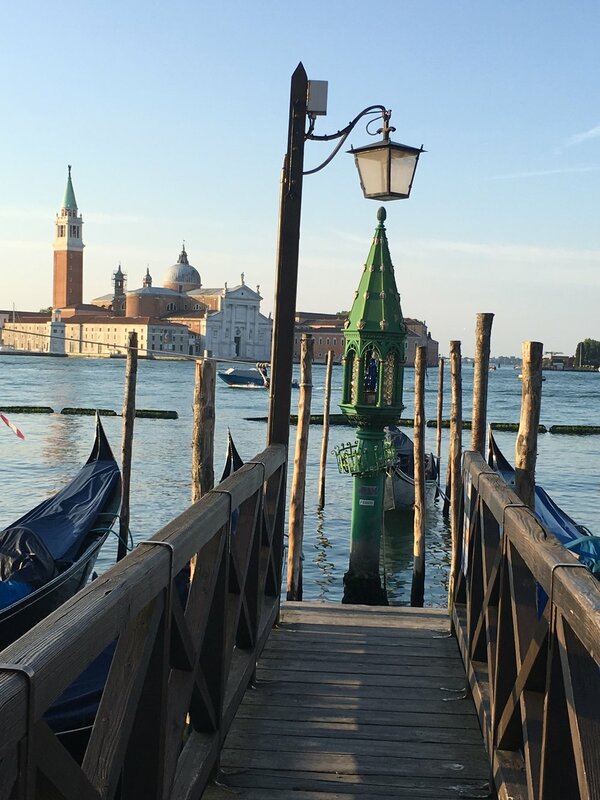 Prisoners being taken to the prison had one last glimpse of Venice, one last breath of fresh air before being taken down into darkness for who knows how long. One can imagine that they would sigh as they passed these last views of the city before their incarceration. 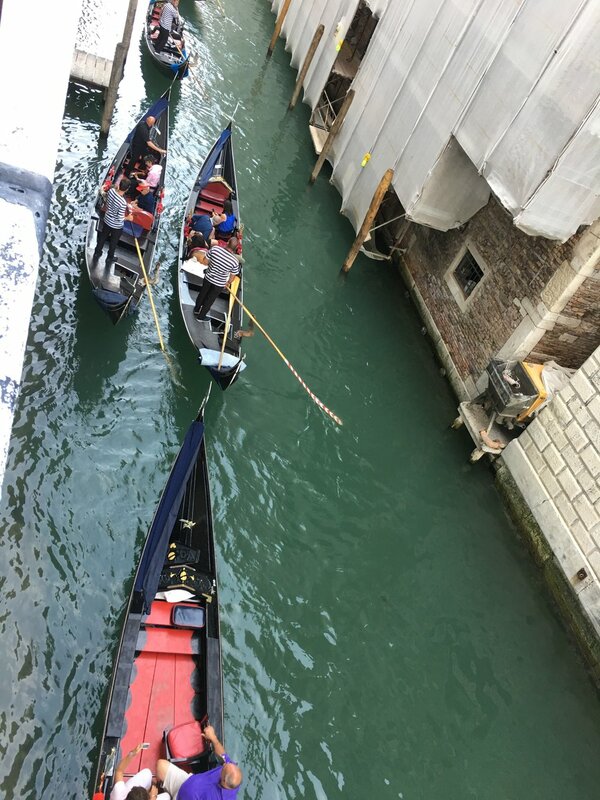 A view of gondolas in one of the canals below, seen from the bridge of sighs. 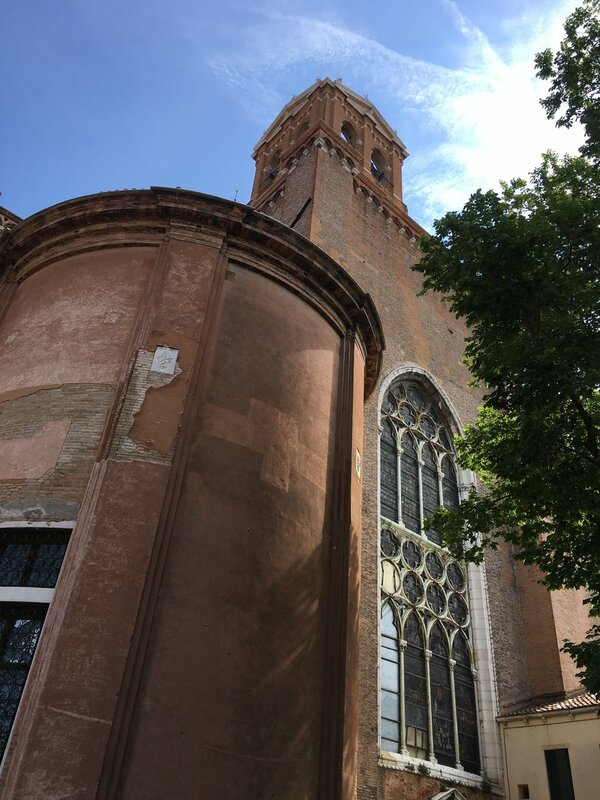 Sunday, May 20 - The road to Venice!